Upgrading your kitchen sink with new hardware is a great way to boost productivity and add value to your home. If you've been struggling with multiple faucet handles or a faucet that doesn't allow enough clearance, consider replacing your faucet with one of the newer options on the market. The stem of the Kohler Simplice faucet rotates a full 360 degrees for easy use with a divided sink. The controls can be installed on either side. There's a self-docking extendable head with spray, stream and pause modes and a pivot joint at the end of the hose for an impressive range of motion. Kohler is one of the largest names when it comes to kitchen and bathroom plumbing fixtures. This faucet is backed up by a lifetime limited warranty and Kohler is more than happy to offer replacement parts and advice to fix any problem years after your purchase. While the faucet itself is made of metal, the spray head is mostly plastic with a thin decorative coating to match the rest of the faucet. This is pretty standard -- it helps to insulate your hand from hot water and keep your counter from cracking should you drop the head. Should any problems manifest with the spray head, it can only be replaced as a unit. The lifetime warranty means that you probably won't pay for this, but it's a small downside if you don't want to deal with Kohler customer service. This faucet must use a single hole installation. Installation should take under an hour with a screwdriver and wrench for those savvy enough to tackle it. We think that reliability and durability should be some of your first concerns when comparing faucets. The lifetime warranty from a major brand on this Kohler Simplice faucet means that you don't have to worry about these issues. It's definitely a top pick to consider for almost any household. 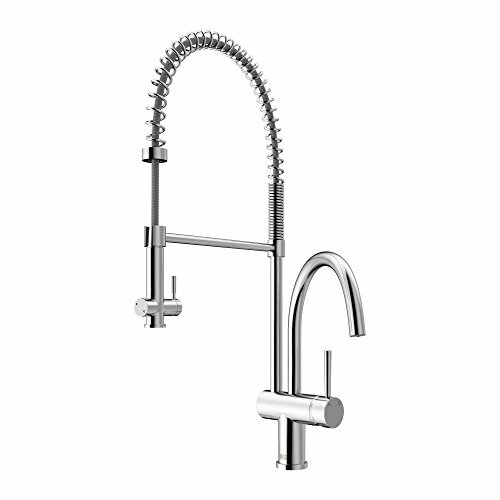 The Delta Faucet offers similar functionality to our other picks. It has a 60" hose that can reach 20" away from the base. The stem can swivel in a full circle, and the control handle can be installed facing any direction. There's no pause feature, however, and the stream and spray modes are operated via a rocker switch. This means you can turn the faucet on and off without losing your preferred mode. Like the Kohler, the Delta Faucet comes with a lifetime limited warranty. Delta Faucet was the market leader in 2013 and has pretty solid customer service. You can install this faucet in either a 1 or 3 hole configuration. Installing things according to the instructions is pretty simple. There are a couple of design flaws with this faucet that you might want to accommodate for while you're installing things. All of them are related to the hose: there's no mechanism that prevents you from pulling it too far, and it's attached by a plastic clip that seems rather flimsy. A few zip ties and some creativity should diminish any danger of accidentally yanking the hose free. The head of this faucet has magnets in it that allow it to snap into place. This is fun to use, but we're not sure we prefer it over designs where the head rotates freely and doesn't care which side is up. Like the Kohler, we think the warranty on this faucet makes it an excellent choice for almost every household. 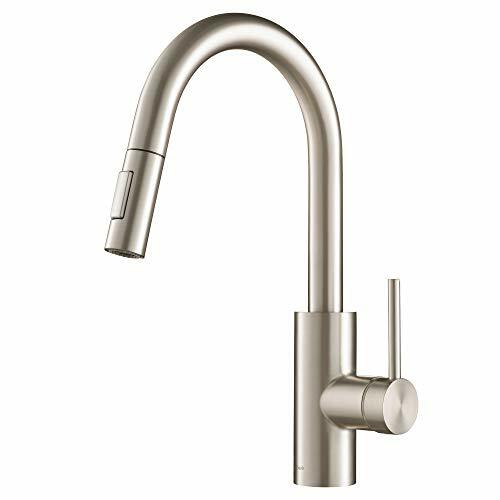 The features are slightly different, with this Delta Faucet offering mode choices that persist through multiple uses and a magnetic nozzle head. 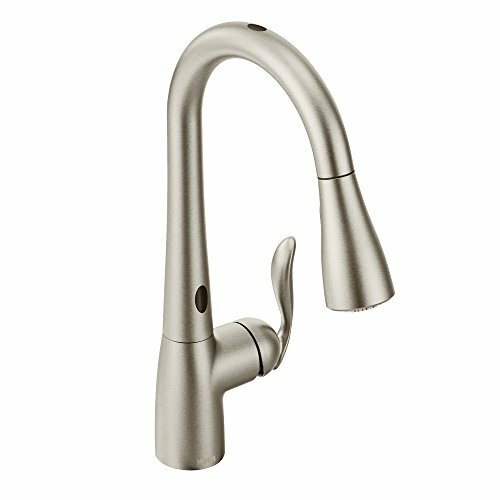 While all of our other picks are pretty similar, the Moen Arbor with Motionsense is unique. It comes with two sensors for hands-free operation, meaning you'll never have to touch the handle to wash your hands after handling raw meat or kneading sticky dough. These sensors complement a full suite of faucet features. Moen has equipped this faucet with a flexible, extending head that docks itself when you're done. There's a spray mode as well as a pause button so you can maneuver the nozzle without splashing water outside of your sink. Any manual input will override a sensor mode. This allows you to adjust temperature after triggering the faucet with a wave and ensures that you'll still have water during a power outage or while your batteries are dead. The entire faucet swivels about 45 degrees in either direction. This will allow you to direct water to either side of the sink easily, but you don't get a full turn of motion. The manual control for the faucet must be installed on the right. The extendable hose is long enough for most kitchen tasks, but we're used to seeing faucets that are free to swivel a full 360 degrees. There's an additional box you need to install under your sink to accommodate the sensor modes. This box has a knob that adjusts the default water temperature during hands-free operation. You'll need to either plug this box into A/C power or utilize the included batteries and battery compartment to provide electricity. The hands-free operation itself is intuitive and practical. The sensor on the top provides a steady stream of water for about two minutes and can be turned off with another wave. The sensor on the base maintains water flow as long as you keep your hands or another object in front of the faucet. You're not obligated to use either mode and you can even disable the sensors temporarily by holding your hand over the top of the faucet for a few seconds. There are three big downsides here. One, you're paying for two sensors and a control box when you buy this faucet. Two, there's a lot of added complexity. This makes installation more difficult and means there are more parts that might fail over time. Finally, a hands-free faucet solves half of a problem. When you're done rolling meatballs and your hands are covered in ground beef, washing your hands is a two-step process. You need to apply soap and then wash under running water. Keeping germs and bits of food off of your faucet handle isn't going to do much good if you just get those same germs and food bits on your soap dispenser. Depending on your sink setup, you might be able to pump soap with your (hopefully less dirty) forearms or elbows, but at that point, you might as well use those same clean body parts to turn the lever on your faucet too. Hands-free faucets are pretty neat. The Moen faucet's sensors are pretty convenient and user-friendly. If being able to fill a jug or rinse a dish just by sticking it under your faucet appeals to you, this might be the right faucet for you. The Kraus kitchen faucet offers a more modern aesthetic to compliment the usual set of features. It has a self-retracting hose that extends about 20" from the base, a stem that swivels a full 360 degrees and a lifetime limited warranty. There's an included plate to allow this faucet to be installed in either a 1 or 3 hole configuration. The Kraus faucet differs from our other picks in a few important ways. First, it's very aesthetically unique. Whether this is a good or bad thing will depend on your tastes. We think it's nice to have an alternative to the homogeneous design shared by the Delta, Kohler and American Standard. Second, installing this faucet is extra easy. Kraus has designed a special QuickDock system that means you pretty much just drop the faucet in and connect it to your water lines. It'll probably take you longer to remove your old sink than to install this new one. Notably, the hose comes with a counterweight system that you literally just snap on. 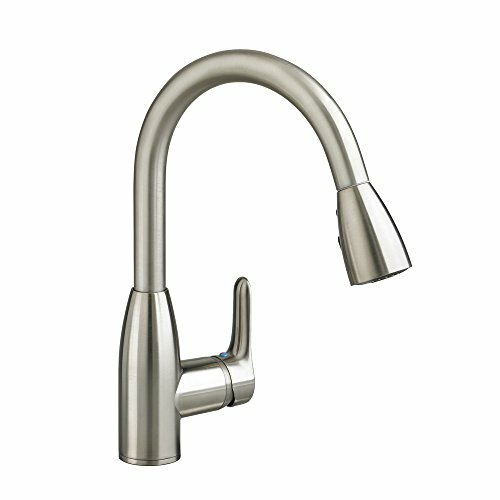 While there's no sensor operation or pause button on the sprayer, the Kraus kitchen faucet is great for any household that wants a unique looking faucet or just wants an easier installation. The American Standard faucet swivels a full 360 degrees and has a self-docking, pull-down spray head with spray, stream and pause modes. The included warranty covers manufacturing defects for the lifetime of the faucet. The counterweight that comes with this unit is slightly too light for most homes. This won't interfere with operation, but it will mean that the hose won't retract as easily as it should and the head might pop out slightly from a resting position when you turn up the water flow. You can fix this yourself by attaching some weights to the provided counterweight, but American Standard is also happy to sell a heavier weight should you want one. Overall, this is an excellent product that's quite comparable to the Kohler faucet. It's difficult to choose one over the other: they've both got the same features, with both including a pause mode, and they've got similar lifetime warranties from well-established companies (although we hear American Standard might have slightly better customer service). The best kitchen faucets are user friendly. What sort of work do you need to do in your kitchen? Is your sink put to hard use with fresh produce from your garden all summer long? If so, a single handle kitchen faucet with an attached sprayer might be an ideal upgrade. Are you a tea drinker? Consider purchasing a sink hardware package that includes the attachments necessary for an instant hot water dispenser. There are a lot of options out there to help you upgrade your kitchen sink. While it's tempting to delve right into the high end kitchen faucets, it's important to take some time to consider your needs and preferences. How many cooks use the space? Is your kitchen a showplace or a workroom? Are you hoping to make it a bit of both? The Dresden fixture with pull-down spray from Vigo offers extreme flexibility and easy sink access. 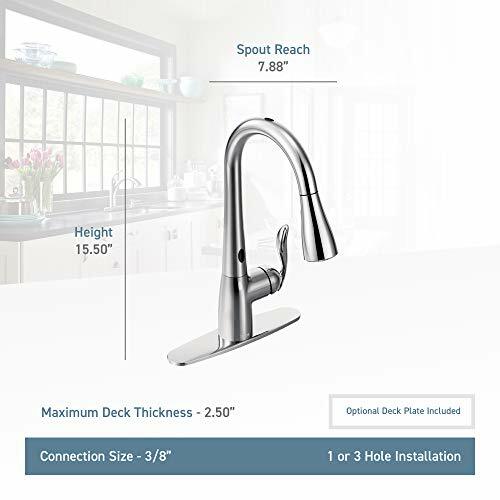 You need only one sink hole to install this unit, but get a separate high neck faucet and a pull down spray on a flexible line. Controls on the spray handle allow the user to switch from faucet water flow to sprayer. One of the nicest new features in kitchen faucet design is a tall, curved neck. Home design authorities at HGTV.com offer plenty of suggestions on updating your sink hardware with these easily accessible and often flexible fixture. If you're filling a stock pot with water, rinsing a large batch of fresh vegetables, or preparing a turkey, the extra height access provided by these ingenious faucets can give you the space you need to work comfortably. 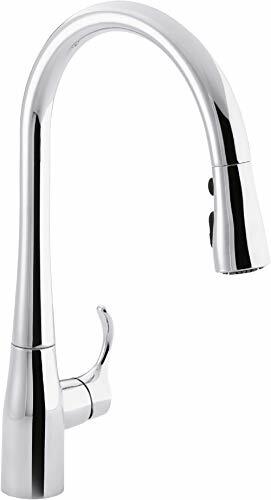 Another new feature sure to come in handy is the flexible faucet neck. Long-time plumbing manufacturers at American Standard offer an ingenious flexible faucet with plenty of access underneath the faucet due to a swiveling stabilizer bar, and a pull down faucet attachment with three settings of spray intensity. Do you like to get your hands dirty in the kitchen? If blending meatloaf by hand or turning bread dough is a task you enjoy, a double handle kitchen faucet may not be your best option. You can turn on the tap and adjust the temperature with your wrist using a touchless kitchen faucet while you clean up your hands. Plumbing industry leaders at Kohler offer a sleek faucet in stainless, chrome and oil-rubbed bronze. Not only is this faucet easy to operate when your hands need washing, but the pull down spray tool has a magnetic docking mechanism to make it easier to return the spray head to the correct location. If you don't like a lot of clutter around the sink, you might enjoy a 4 hole kitchen faucet. This combination often offers a space for a hand soap dispenser. Be aware that you will need to get under the sink to replace this hand soap when it runs out, so leave yourself an easy path to replenish your supply. Depending on the hardware you buy, you may have some flexibility in where the holes are placed, so work with your contractor to place your kitchen sink hardware exactly where you need it. For fans of unique design, experts with Sanliv have created a unique double handled kitchen faucet the requires only one hole. The handles are perched on a triangular base with an art deco feel, and the neck offers a high arch for easy access. This sleek and striking faucet is available in bright chrome. It's also important to consider what type of finish you prefer. While chrome is shiny and eye-catching, it also shows water spots easily. Consider a brushed nickel finish for a cleaner look. If your home features brass or copper fixtures elsewhere, kitchen sink hardware is also available in these tones. Oiled copper and bronze in particular offer a dark, elegant finish. Thanks to the wide variety of tones and finishes available in kitchen sinks, counter tops and back splashes, the types of kitchen faucets available offer homeowners the chance to make unique combinations as they upgrade. Fans of traditional finishes may enjoy bright chrome fixtures, while farmhouse kitchens may call for polished copper fixtures. Your decision must be made on your long-term requirements. Will you be in the house for the future, or are you planning to sell? Finding the right kitchen sink hardware may lead you to the most popular kitchen faucets, or away from them. Upgrading to sell your home may require a more neutral choice. Whether you're planning a simple upgrade to your sink hardware or a whole kitchen renovation, take the time to consider your needs and invest in what works best for your household.